The ES-5 is a powerful and versatile effects switching system that gives you complete control over a pedalboard. To start, you connect your pedals to the ES-5’s audio loops, and then activate the loops as needed to achieve various pedal combinations. The on/off state of each loop and many other parameters can be saved in a patch, allowing you to instantly change sounds without dancing around to press the switches on individual pedals. Your guitar tone is also maintained, because it only travels through an effect when it’s needed for a particular sound. Other loop switchers for pedals can accomplish the same thing. However, the ES-5 goes way beyond this core functionality, providing powerful routing flexibility, real-time control options, MIDI, and more in a space-saving unit. This gives you a great improvement for controlling effects that directly bring your creative ideas to life. One of the ES-5’s key features is its innovative routing flexibility, which provides the ability to easily rearrange the order of a chain of stompbox effects. This gives pro-level capability to access a wide array of effect combinations, offering total creative freedom to achieve unique sounds. In addition, the ES-5’s parallel chain function increases the effect combination options further, thereby expanding the final sound variation capability exponentially. What’s more, all of these programmed configurations can be saved for instant access during a live performance. Isn’t it about Time You Got Connected? Supporting the ES-5’s superior functionality is its comprehensive connectivity, which empowers this amazing switcher to do the job it does. In addition to the five effect loops on board, there are two TRS control output jacks and a TRS control/expression input jack. MIDI capability is also included for integrating seamlessly with MIDI-controlled stomp effects. These centralized controls make the ES-5 even more powerful as a total command center of sound creativity. Of course, as is consistent throughout the ES-5 system, all of these control settings are also storable. In addition to routing capability and connectivity, the ES-5 pays particular attention to sound quality. It’s designed in a way that does not contribute to sound deterioration, keeping your tone pure and free of noise. These results are accomplished by carefully designed analog circuitry developed with the know-how, experience, and design expertise of the BOSS engineering team. In further regard to tone pureness, the ES-5 is equipped with input and output buffers that can be turned on and off independently as needed to suit any rig. *The output buffer is combined with the onboard mixer for the parallel chain function. The ES-5 effect switching system is more than just a smartly designed tool for the creation of awesome sounds. It is also a handsome piece of hardware that is going to look really good on your pedalboard. Built with durable mechanical functions in a road-tough design, the ES-5 combines huge technical innovations with small useful conveniences. 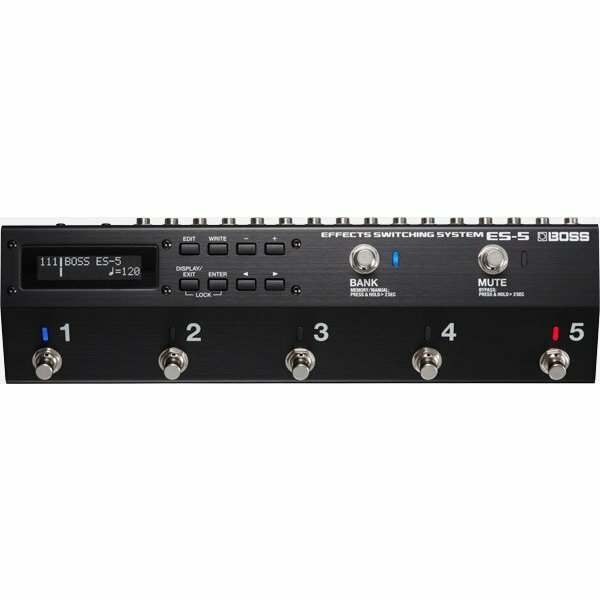 Memory capability with 200 patches, a large display with extensive naming capacity, and robust responsive foot switches with full assignability are just a few of the features that even make this switcher the choice of the pros.